The Government of Argentina has called on Venezuela and Guyana to favour dialogue and a peaceful resolution, in conformity with International Law, regarding their territorial controversy over the region of Essequibo. The Foreign Ministry release which was recently released, also underlines the significance of territorial integrity, and that neither side adopts measures that endanger peace and security in the region. The territorial dispute, dating back to the 1830s, has heated up in recent months, after ExxonMobil which is licensed to work in the Stabroek Block, announced in 2015 that it had discovered large reserves of oil. And up to a few weeks ago, local authorities were alerted to the intrusion on ExxonMobil contracted vessels by the Venezuelan military. Speaking to the National Assembly on the matter, Foreign Affairs Minister, Carl Greenidge said that it was on December 22, last, the Ministry received a report from Esso Exploration and Production, Guyana Limited (Exxon Mobil) that vessels under contract by the company and its partners CNOOC of China and NEX of the USA, performing exploratory seismic work within the Stabroek block, were intercepted at 10.30 hours that same day by the Venezuelan Navy. Greenidge said that a reckless attempt was made by the Venezuelans to land a helicopter on the deck of one of the Exxon contracted vessels, the Ramform Tethys. The Minister said that the vessel was flagged by the Government of the Commonwealth of the Bahamas and had a total of seventy crew members on board including the Captain. He said that it was intercepted in the Exclusive Economic Zone (EEZ) and continental shelf of the Cooperative Republic of Guyana at an approximate distance of 140 kilometres from the nearest point to the provisional equidistant line with Venezuela and some 250 kilometres from Punta Playa, the westernmost point on the land border of Guyana. More than two weeks prior to this interception, Greenidge said that the world and its mariners, including Venezuela, had been alerted to the intended commencement of seismic work in Guyana’s EEZ. He said that this alert was by way of an advisory from Guyana. 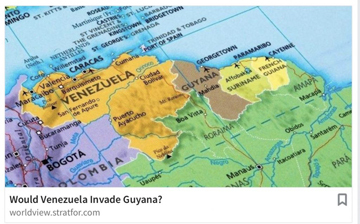 Greenidge added, “The Ministry of Foreign Affairs sent that same day, a formal protest to the Government of Venezuela conveying the complete rejection by the Government of Guyana of this hostile and unlawful act. “It stated that Venezuela’s threat and use of force to impede Guyana’s exercise of sovereign rights in its Exclusive Economic Zone, is a manifest violation of the Charter of the United Nations and general international law. Further to this, Greenidge said that the Ministry of Foreign Affairs of Guyana informed the Secretary General of the United Nations of the incident and requested that the matter be placed on the agenda of the United Nations General Assembly and Security Council. Additionally, Greenidge said that in response to Venezuela’s recent aggressive actions in the maritime areas under Guyana’s jurisdiction, the Government has sought and successfully obtained, the support of the international community, especially from CARICOM, the United States and the United Kingdom, all of which have issued statements condemning Venezuela’s unlawful conduct. The Foreign Affairs Minister said, “No State which seeks to impose by force its own unilaterally decreed ‘rules’ on a militarily weaker state can expect to have that smaller State willingly accept to engage in dialogue under conditions of coercion. Greenidge said that the Government of Guyana has informed Venezuela that it will not be intimidated by the heightened hostility by that country as it continues to pursue its economic development agenda. He said that Government has since reminded Venezuela that the Stabroek Block is an area over which Guyana maintains sovereign rights, located in the Exclusive Economic Zone of Guyana. He said, too, that companies with concessions licenced by the Government of Guyana in this area will continue to implement their scheduled programmes of activity. PPP/C reject Ramjattan sends police to murder us for petty theft and jail us for a long time for minor crimes, but what is this PPP/C reject going to do when Maduro will use his military? Ramjattan yuh cyant do #$!#! Venezuelan gangs have taken over a few islands and gold mines up north, if we can’t stop that, how are we going to stop Maduro when Ramjattan is jailing thousands of able-bodied men in Camp St prison?